Silvine Punched 4 Hole Recycled Ruled Feint and Margin Refill A4 Pad (Pack of 6) RE4FM-T Pack of 6 "Silvine Recycled A4 Refill Pad. Headbound, feint and margin pad, punched 4-holes, manufactured from recycled material. Each pad has a printed cover and contains 80 sheets of high quality, white paper. Size A4 - 297x210mm. Pk6." Silvine Punched 4 Hole Headbound 80 Leaf Ruled Feint and Margin Refill A4 Pad (Pack of 6) A4RPFM Pack of 6 Silvine Refill Pads. Headbound. Punched 4 holes. 160 feint ruled and margin pages. Quality paper perforated for easy tear. Size: A4. Pack of 6. Silvine Punched 4 Hole Punched 80 Leaf Ruled Feint and Margin Sidebound Refill A4 Pad A4SRPFM Pack of 6 "A4 sidebound refill pad, 80 leaves, punched 4 holes 8cm gauge, printed top. Ruled feint and margin. Pack of 6." 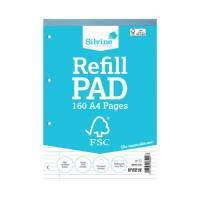 Silvine Punched 4 Hole Headbound 80 Leaf Ruled Feint Refill A4 Pad (Pack of 6) A4RPF Pack of 6 Silvine Refill Pads. Headbound. Punched 4 holes. 160 feint ruled pages. Quality paper perforated for easy tear. Size: A4. Pack of 6. Silvine Punched 4 Hole Headbound 80 Leaf Ruled Narrow Feint and Margin Refill A4 Pad A4RPNM Pack of 6 Silvine A4 Refill Pads. Headbound. Punched 4 holes with 80 narrow feint ruled white leaves with margin. Pack of 6. 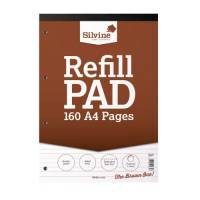 Silvine 80 Leaf Ruled 5mm Square Refill A4 Pad (Pack of 6) A4RPX Pack of 6 Silvine A4 Refill Pad. Headbound pad with perforated pages for easy removal and punched four holes. Ruling - Quadrille 5mm squares. 160 pages per pad. Pack of 6. Silvine A4 Refill Pad 4 Hole Punched 160 Pages Feint Ruled With Margin (Pack of 5) FSCRP80 Pack of 5 "80 leaf recycled refill pad. Headbound, punched four holes, ruled feint and margin and perforated." 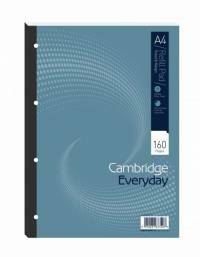 Cambridge Everyday A4 Refill Pad Ruled Margin Pack of 5 846200192 Pack of 5 A4 160 page refill pad feint and margin. 4 hole punched for instant filing. Durable cloth binding. Sturdy white backboard for extra strength. 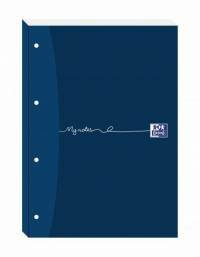 Oxford My Notes A4 Refill Pad Ruled Margin 200 Pages Sidebound Pack of 5 846400176 Pack of 1 Oxford My Notes Refill Pads. Sidebound pads featuring premium quality 90gsm paper and gloss coated covers providing added durability. 200 pages. Feint and Margin Ruled. Size - A4. 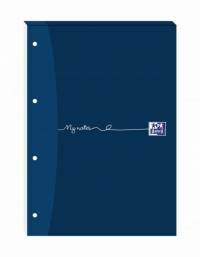 Oxford My Notes A4 Refill Pad Ruled Margin 160 Pages Headbound Pack of 5 846400177 Pack of 5 A4 refill pads head bound with punched 4 holes to suit all binders. Ruled and margin. Pack 5. 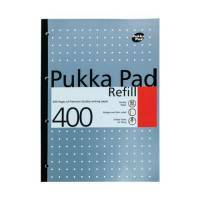 Pukka Refill A4 Pad 4 Hole Punched Feint Ruled and Margin 400 Pages (Pack of 5) REF400 Pack of 5 Pukka Pad A4 Refill Pad. High quality pad with 400 pages of 80gsm. Feint ruled paper. Pre punched with four holes. 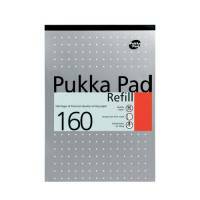 Pukka Refill A4 Pad Headbound Feint Ruled With Margin 160 Pages (Pack of 15) URP80 Pack of 15 "Unipad Refill Pads. Sidebound pads with sturdy protective covers and backboards each with 80 leaves of quality Feint and Margin Paper pre-punched with four holes. Size - A4. Pack of 15 - 5 x blue, 5 x green and 5 x pink." 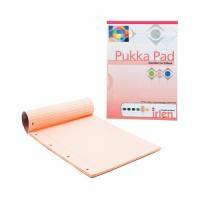 Pukka Refill A4 Pad Headbound Feint Ruled With Margin 4 Hole Punched 160 Pages (Pack of 6) 80/1 Pack of 6 "Pukka Refill Pad, 160 pages of premium quality 80gsm writing paper. A4 size. Ruled with margin and four holes drilled down the left hand side for easy filing. The thick backboard makes for a much stronger pad." Q-Connect A4 200 Leaf Refill Pad Feint Ruled and Margin 2 Hole Punch Headbound (Pack of 5) KF02234 Pack of 5 Q-Connect A4 Refill Pads. Pre-punched pads with two-holes suitable for use with any 2 ring binders or lever files and sturdy covers protect your notes from dust and dirt. Each pad contains 400 sheets of quality white feint and margin paper. Q-Connect A4 Ruled Feint Margin Refill (Pack 2 Hole Punched Headbound (Pack of 10) KF02228 Pack of 10 Q-Connect A4 Refill Pads. Pre-punched pads with two-holes suitable for use with any 2 ring binders or lever files and sturdy covers protect your notes from dust and dirt. Each pad contains 80 sheets of quality white feint ruled paper with margin. Q-Connect A4 Ruled Feint Refill Pad 2 Hole Punched Headound 80 Leaf (Pack of 10) KF02227 Pack of 10 Q-Connect A4 Refill Pads. 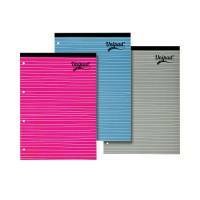 Pre-punched pads with two-holes suitable for use with any 2 ring binders or lever files and sturdy covers protect your notes from dust and dirt. Each pad contains 80 sheets of quality white feint ruled paper. 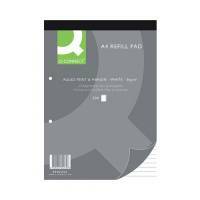 Q-Connect Refill A4 Pad NFM 80Leaf Pack of 10 Q-Connect A4 Refill Pads. Pre-punched pads with two-holes suitable for use with any 2 ring binders or lever files and sturdy covers protect your notes from dust and dirt. 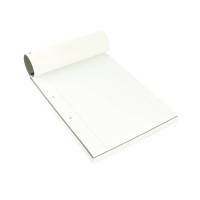 Each pad contains 80 sheets of quality white narrow feint and margin paper. 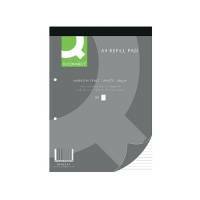 Q-Connect A4 Narrow Feint Ruled Refill Pad 2 Hole Punched Headbound 80 Leaf (Pack of 10) KF02229 Pack of 10 Q-Connect A4 Refill Pads. 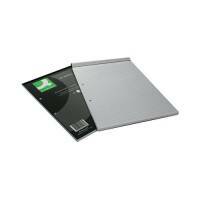 Pre-punched pads with two-holes suitable for use with any 2 ring binders or lever files and sturdy covers protect your notes from dust and dirt. 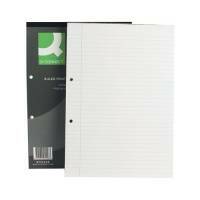 Each pad contains 80 sheets of quality white narrow feint ruled paper.